If the only way you’ve ever eaten pinto beans is refried and mashed, I weep for you. Truly. I personally believe the humble pinto bean is the best food on the entire planet. Earthy, creamy, multitalented starch and protein in a compact package, plus if you live in a civilized county, you can buy five pounds for two bucks. I would eat them three times a day, if I could. Only the homemade kind, though. Canned I could only stand to eat once a day. Canned and refried– well, that was a staple of those years when I was going to school full-time and working full-time and interning full-time… Let us not speak of those years again. 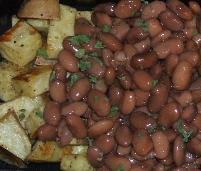 The key to a quick-cooking pinto bean is not to make a lot of them at one time. Yes, well, this is crappy advice for people with huge families, in which case I have two words for you: crockpot. Sort through your dried pinto beans and if there’s any bean that doesn’t look like the others, toss it out. Dump the pinto beans into the pot you’re going to cook them in. Add the water, and skim out any of the floaters. Dump in the garlic (according to my great-grandmother, ‘the garlic takes the farts away’) and the olive oil, and put it on the stovetop on high heat*. Watch the pot, it will eventually boil like crazy. At that point, turn the heat to the lowest setting and put on a tight-fitting lid. Go do something important for 45 minutes, like learn to cuss in Chinese. Take the lid off the pot (Note: don’t be going in and fiddling with the beanies during those 45 minutes! Taking the lid off the pot lets the farts back in! lets the heat out, and stirring breaks the beans into wee pieces!) They are done when they are this lovely, dark brown color and all the spots have disappeared. If they aren’t gone, add about 1/2c of water and put the lid back on for 20 more minutes. For the simplest meal ever, serve them up in bowls with the gravy, some corn tortillas, cilantro if you got ’em, and if you like cojito cheese (a semi-soft cow milk cheese that, for all I can tell, has no taste), dump that on top. Cheddar shreds work well, too. Extra beanies will live well in the fridge for about a week, and freeze for three months or so. Or you could eat them with sweet potato home fries, like in the photo. Because I like sweet potato home fries, okay?! *Yes, yes, I know that alllll the other recipes for beans say to rinse and soak the beanies. The other recipes, as far as I can tell, ate some of that skeezy cheese in the back of the refrigerator again; I tried soaking my beans once and the only thing that happened was I didn’t have to add quite so much water. Still took forever to cook.